Wooden hangers at low prices. Also, fast delivery on wooden coat hangers. Order high quality wooden clothes hangers in handy packs now. Choose from our wide range of premium wooden jacket hangers, wooden kids hangers and wooden clip hangers. Select from small pack sizes of 10, 50 or box quantities for more. 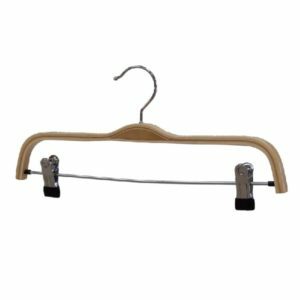 Hang jackets and coats using our extra strong 42cm wide SJ42 wooden jacket hangers. Made from natural wood and complete with a strong swivel chrome hook. As a result of the smooth, flat, space saving surface the SJ42 is perfect for hanging jackets in your wardrobe. Also, ideal for retail display to show off coats and jackets. 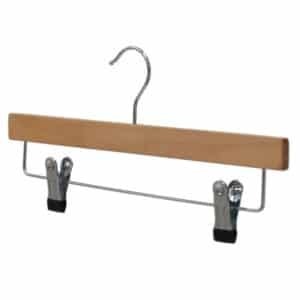 Hang ladies coats and jackets with our 42cm wide laminated wooden jacket hangers. As a result of the stylish, laminated wooden finish they are perfect for retail display in boutiques. Also, the anti-slip shoulder grips stops coats and jackets from slipping off. Made with a strong metal hook and light wood colour. Order our lovely laminated wooden trouser hangers to display trousers and skirts. Due to their stylish, light wood colour finish, laminated clip hangers are perfect for displaying the latest fashions. Use the strong metal clips to secure garments. Hang garments of different sizes by simply sliding the clips along the bar. Get great deals on wooden clip hangers only at hangers.ie. Use our 35cm wide wooden trouser hangers to hang both adults trousers and skirts. Simply adjust the strong metal clips by sliding them along the bar to hang garments of different sizes. Also, the clips hold garments without marking them. We also refer to wooden clip hangers as wooden peg hangers. 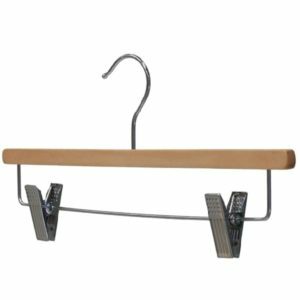 Buy our 35cm wide extra strong wooden clip hangers to hang heavier trousers such as denims. As a result of their extra wide padded wooden bar they are strong enough to hold jeans in place. Also, made with a long lasting metal hook. The WWCP30 is made with a smooth natural wood finish and a flat, space saving design. As a result ideal for hanging lots of kids garments in a wardrobe. Secure childrens trousers and skirts using the strong metal clips. In addition, simply slid the clips along the bar to hang garments of different sizes. Choose our anti-theft wooden hangers with bar to keep hangers secure in hotel bedrooms. Ideal for hanging coats, jackets, shirts, blouses and tops because they are 42cm wide. Also, hang tousers by folding them over the trouser bar. Hang dresses, skirts and tops by slipping loops over the shoulder notches. Please note we only sell the anti-theft wooden hangers and do not stock the anti-theft security rings. 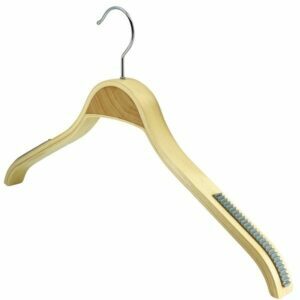 Get FREE delivery on wooden coat hangers across Ireland and UK on all orders over €75 + VAT (or Sterling equivalent). Also, choose to pay in either Euro or Sterling. 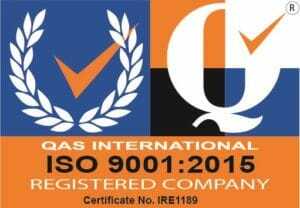 We aim to despatch orders in only 1 to 5 working days because we keep huge stocks. Ordering wooden clothes hangers is now simple thanks to hangers.ie. Also, choose small pack sizes of just 10 or larger packs of 50 or box sizes. 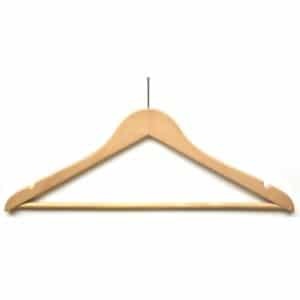 Buy wooden hangers now in only a few clicks and pay with our super fast, secure PayPal Express Checkout.